The Warby Trail has to be Mamma’s MOST favourite places to relax and chill out with the dogs. It is our Sunday ritual – choose a section of the track to walk the spotty dotties and take in the serenity. The Warburton Trail is perfect for that. Originally the railway line from Lilydale to Warburton, the walking track is used by thousands of people each day – when there is 40kms of track - there is plenty of space to share! On any given day you will travel alongside walkers and runners, bikes and scooters, dogs and horses, and of course – sleeping babies in their prams. Each section that runs between the old station platforms has its own unique personality as the landscape changes as quickly as Melbourne’s weather. Distances vary from station to station as well as the inclines. The flattest section to take the kids on their bikes is from Seville to Killara or Woori Yallock to Launching Place. There are steep bits between Mount Evelyn and Wandin and then again from Killara to Woori Yallock so best avoid with the training wheels. 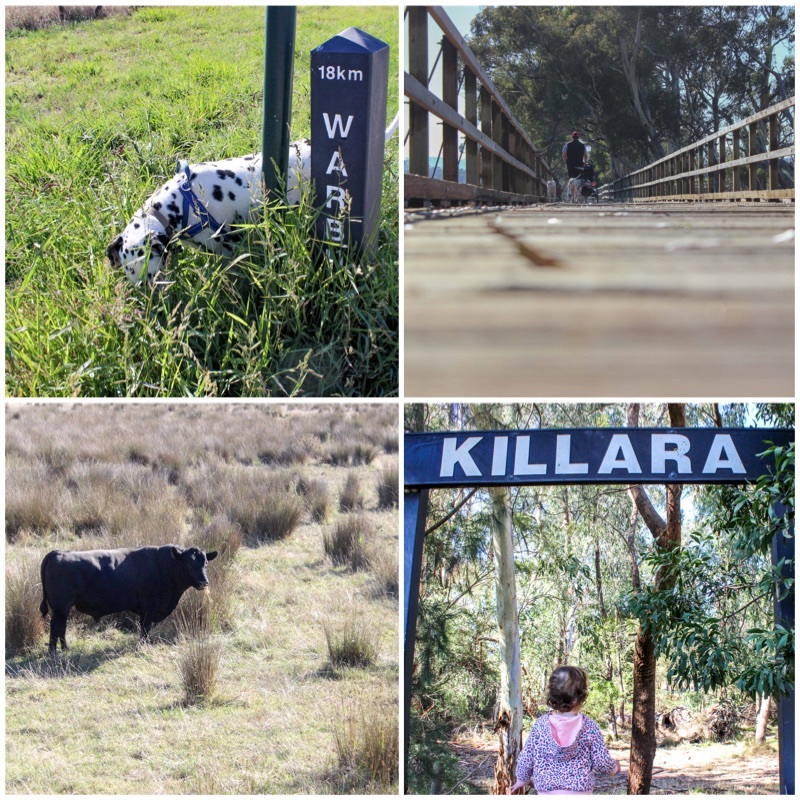 There are animals galore on many parts of the track with Woori Yallock to Launching Place with Mamma nicknaming it ‘The Farm Trail’. Mamma’s special mentions: Facilities are limited along the trail, but the best café to take a break is the Carriage Café in Seville. Or if play is more your style, there are parks close to the track at Lilydale, Mount Evelyn, Worri Yallock and Yarra Junction.